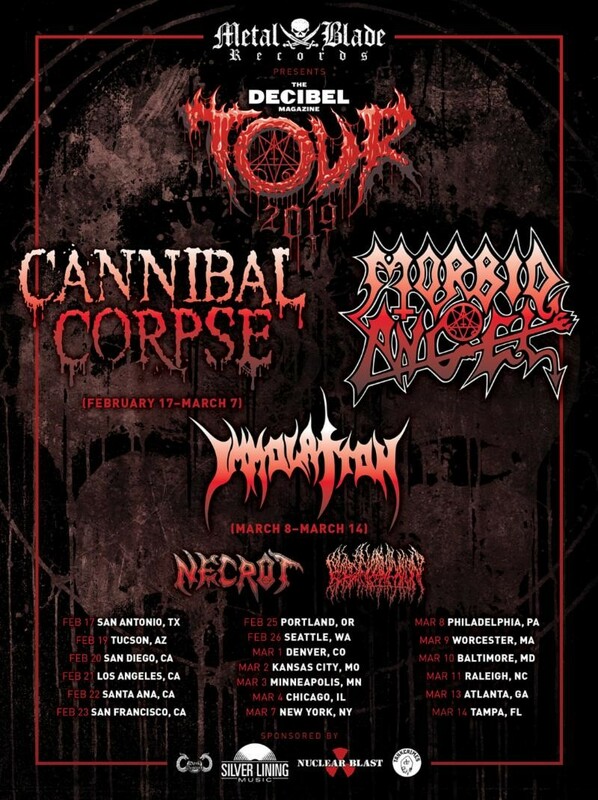 The lineup for the 2019 Decibel Magazine Tour once again breaks new ground, as legendary death metallers Cannibal Corpse and Morbid Angel join forces for the first time ever in America to co-headline the winter tour. Rising Bay Area brutalizers Necrot and space-obsessed Denver death dealers Blood Incantation round out this once-in-a-lifetime bill. New York death metal icons Immolation will join the final week of the tour as main support to Morbid Angel, as Cannibal Corpse exit the tour after the New York City date. Presented by Metal Blade Records, and sponsored by Silver Lining Music, Tankcrimes, Dark Descent Records and Nuclear Blast America, the eighth annual Decibel Magazine Tour is once again poised to be the heavy metal tour of the winter. Tickets for the 2019 Decibel Magazine Tour go on sale Friday, November 16 at 10 AM local time and can be found at www.decibelmagazine.com/tour. All dates and venues are below. GODSMACK TO RETURN TO ROAD IN NORTH AMERICA IN 2019, HEADLINING DATES WITH VOLBEAT!